Product information "Sliding Barn Door Ebony-Wood Veneered, Aquatex Glass"
A sliding wood-glass barn door separates rooms from each other, provides privacy and is space-saving. Annoying door slamming is a thing of the past, as this sliding door runs over smooth-running rollers. The door is easy to install, durable and robust. 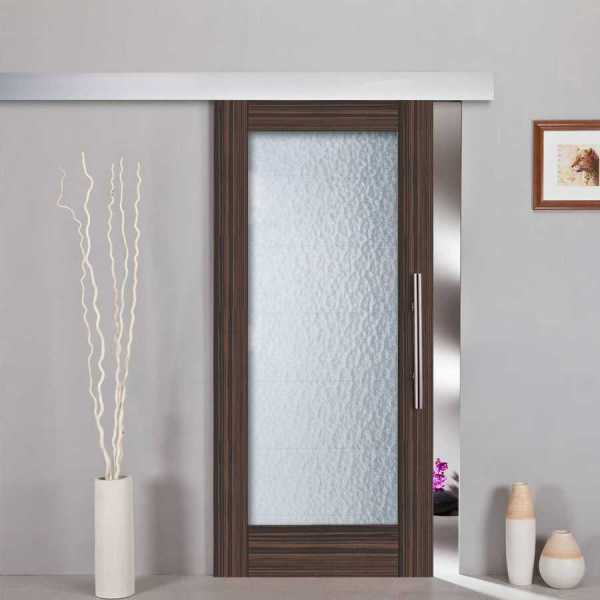 This 1-leaf sliding wood-glass barn door is delivered with an easy-to-install ALU100-W sliding system. All our sliding doors are 'top hung' which means the door is hung into the top rail with two trolley hangers; all the weight is taken by the hangers, making the door easier to move. The guide rail is made of strong aluminum and is therefore rust-free. A sliding wood-glass barn door gives your room a special and elegant flair. Related links to "Sliding Barn Door Ebony-Wood Veneered, Aquatex Glass"
Customer evaluation for "Sliding Barn Door Ebony-Wood Veneered, Aquatex Glass"